On 30 May, six staff members of AGS Movers Cameroon were presented with awards for their years of good and faithful service to the company. The official ceremony took place with a local government official, the Sub-prefect of Douala, Guillaume Dehem, Network Manager of AGS Movers Africa, Hervé Christien, Manager of AGS Movers Cameroon, and Albéric de Colnet, Sales Manager for AGS Movers Cameroon. 1 medal to René Guy Nanga Tsimi (silver). A toast to the honoured employees closed the ceremony. 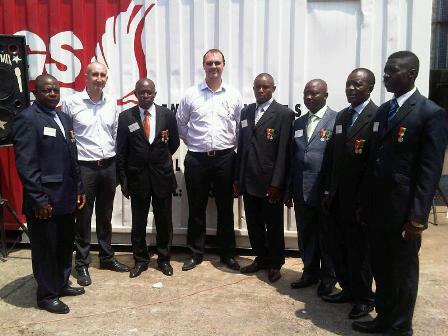 Our congratulations to AGS Movers Cameroon’s employees for working with such diligence and care. These staff members have built up a reputation for quality which has made AGS an outstanding mover in Cameroon.